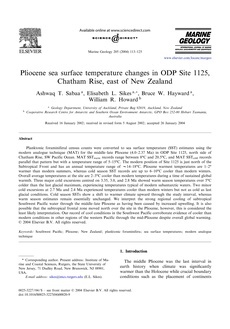 Planktonic foraminiferal census counts were converted to sea surface temperature (SST) estimates using the modern analogue technique (MAT) for the middle–late Pliocene (4.0–2.37 Ma) in ODP Site 1125, north side of Chatham Rise, SW Pacific Ocean. MAT SSTwarm records range between 8°C and 20.5°C, and MAT SSTcold records parallel that pattern but with a temperature range of 5–15°C. The modern position of Site 1125 is just north of the Subtropical Front and has an annual temperature range of 14–18°C. Pliocene warmest temperatures are 1–2° warmer than modern summers, whereas cold season SST records are up to 6–10°C cooler than modern winters. Overall average temperatures at the site are 2–3°C cooler than modern temperatures during a time of sustained global warmth. Three major cold excursions centred on 3.35, 3.0, and 2.8 Ma showed warm season temperatures over 5°C colder than the last glacial maximum, experiencing temperatures typical of modern subantarctic waters. Two minor cold excursions at 2.7 Ma and 2.4 Ma experienced temperatures cooler than modern winters but not as cold as last glacial conditions. Cold season SSTs show a shift to warmer climate upward through the study interval, whereas warm season estimates remain essentially unchanged. We interpret the strong regional cooling of subtropical Southwest Pacific water through the middle–late Pliocene as having been caused by increased upwelling. It is also possible that the subtropical frontal zone moved north over the site in the Pliocene, however, this is considered the least likely interpretation. Our record of cool conditions in the Southwest Pacific corroborate evidence of cooler than modern conditions in other regions of the western Pacific through the mid-Pliocene despite overall global warming.